If you know me at all, you know that I am a lover of analog tools. I am particularly fond of pens and paper. Any pen addict knows that entering the world of better-than-average pens is a hobby that grows as rapidly as your wallet shrinks. Inspired by the Pen Addict himself, Brad Dowdy, as well as his co-host on The Pen Addict Podcast, Myke Hurley, I have recently begun using fountain pens. There is something about a fountain pen that just feels right. It is an entirely different experience than using a gel ink pen. Until I purchased the TWSBI 580, however, all of my fountain pens have been cartridge filled models like the Lamy Safari and the Kaweco Classic Sport. Both of these are fine pens, but I was ready to take it to the next level. After researching my options, I decided that the TWSBI 580 was going to be my next pen. Those who have used the pen rave about its spectacular nib and relatively cheap cost. I picked one up from Goulet Pens for $50 along with a bottle of ink and I am quite impressed. 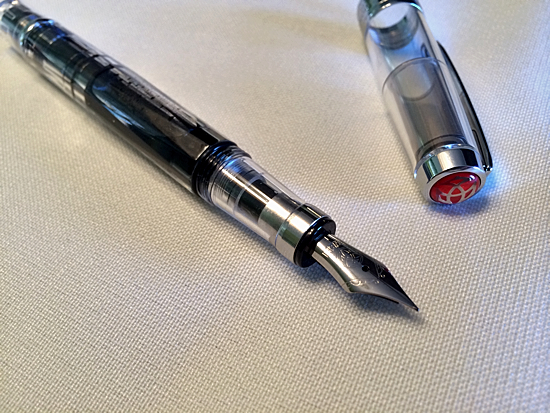 The TWSBI 580 comes in a few color combos, but I chose the clear demonstrator model. I like being able to see the ink slosh around in the barrel. Plus, I can easily tell when it’s time for a refill. The 580 is made out of a durable clear plastic with some chrome accents. The cap of the pen screws onto the pen so that you don’t have to worry about leaks. The pen also features a bright red TWSBI logo on the very end of the cap, which adds a nice accent. One thing that I really like about the pen is that the barrel is not completely round. It is actually many flat sides. I like this because the pen doesn’t roll around when you put it on a flat surface. While that may not seem like a big deal, it relieves a lot of frustration. Another cool thing is that the nib simply unscrews off the barrel. This means that if you want to try out a different nib size, all you have to do is buy it and screw it on. The 580 is the first fountain pen that I have owned that utilizes a piston filling mechanism. The pen itself is essentially a converter. There is a piston inside the barrel that creates an airtight seal with the inside of the pen. To fill it, you simply unscrew the end of the pen so that the piston is extended towards the nib. Next, you insert the nib into your bottle of ink and twist the piston back up into the pen. This suction draws ink up into the barrel of the pen. Filling this pen is a simple as could be. Cleaning it should be pretty easy, although I haven’t had to yet. All you should have to do us unscrew the nib and flush it out, and then just wash out the barrel. The moment of truth comes after you’ve filled your pen. I purchased an F nib, and I am quite happy with it. If you have a Lamy Safari F nib, the TWSBI is slightly finer. I like my Safari F nib, but I have aways wished that it was a touch finer. I have tried the Safari in an EF nib, but it was too fine. The TWSBI 580 is a happy medium. I had some issues with my pen at first. It was skipping and having hard starts. Fortunately, flushing the nib solved the problem. I did not flush my nib before I filled it the first time, but I definitely will in the future. I am happy to say that the 580 writes really well. The pen is smooth and really different from the cheaper fountain pens I have used in the past. The only problems I have experienced with this pen is that sometimes the pen skips a bit when I first start using it. It is usually a little thin on the first character that I write, but it never lasts longer than a letter or two. I have a feeling that this has to do with the ink that I am using, which I will talk about a little later. I am really happy with my 580. It writes great and it feels great to write with. If you are looking to step up your pen collection with a smooth, affordable pen, the TWSBI 580 is for you. Plus, a pen like this lets you have a lot if fun with the hundreds of inks out there. When I set out to find an ink for my pen, I was looking for two things: dark and quick drying. I like black inks, and so I wanted a black that was deep and dark. I was tempted by Noodler's Bulletproof Black, but all of the reviews said that it was very slow to dry. I settled on Noodler's Bernanke Black because people seemed to really like it and it is a fast drying ink. So far, I am pleased with the dryness of this ink. It dries almost immediately when you put it on the page. The ink is also nice and dark. It could be a bit darker for my tastes, bit I am pleased with its shade of black. One issue that I have had with this ink is that because it is a fast drying ink, it tends to dry up a little bit if my pen is sitting out uncapped for a little bit. Usually this means that the pen skips a bit on the first letter that I write. It’s not a huge inconvenience, but I look forward to trying out some other inks in my 580. I am really happy that I settled on this pen. The TWSBI 580 is a great way to jump into fountain pens and inks. If you are interested, I suggest you purchase yours from Goulet Pens. They have incredible customer service and are based in the U.S.
Posted on November 4, 2013 by Brad Dowdy and filed under Fountain Pens, Noodler's Ink, TWSBI, Pen Reviews.